There are a number of different options for the Fill and Stroke paint of an object. Examples of the different options are shown below. The use of these options for the Fill and the Stroke paint is basically the same, so we'll use the word fill to talk about both at the same time. Choices for the Fill of an object, from left to right: No fill, Flat color, Linear gradient, Radial gradient, Pattern, Unset. 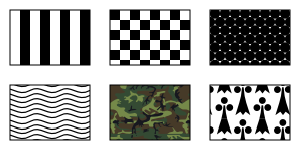 Choices for the Stroke paint of an object, from left to right: No fill, Flat color, Linear gradient, Radial gradient, Pattern, Unset. The stroke has been widened to make it easier to see the effect of the different options. Linear Gradient (a smooth transition between two or more colors). Radial Gradient (a smooth transition between two or more colors in a radial direction). Pattern (filled with a repeating pattern). Unset (necessary for giving different attributes to cloned copies of an object). A Gradient fill type can also be selected by using the Gradient Tool. Each of the options (except the No paint and Unset options) is discussed below. Color can be the simplest or the most complicated aspect of a drawing depending on your needs. 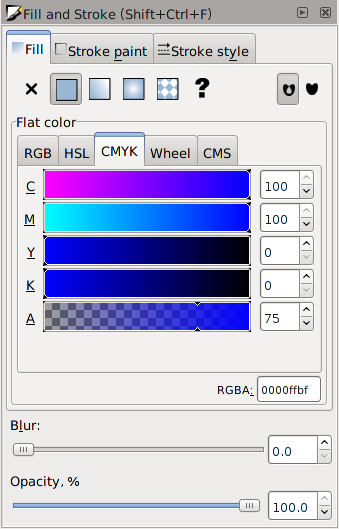 Color is stored internally in Inkscape as a six-digit hexadecimal number consisting of three pairs of digits. Each pair of digits corresponds to the amount of Red, Green, Blue (RGB). This matches the SVG specification for describing color. For example, a color defined as #FF7F00 has red, blue, and green components of 100%, 50%, and 0%, respectively, of the maximum values. In some cases, a fourth pair of digits is added to describe Alpha (RGBA). The A or Alpha attribute may not be familiar to many people. This attribute specifies how transparent the fill should be. It can range from 0 for complete transparency to 255 (hexadecimal FF) for complete opacity. The term opacity is often used in place of Alpha. Its value ranges from 0% (0.0) for a transparent object to 100% (1.0) for an opaque object. In principle, this is a simple description for specifying any color. The complexity comes from assuring that the color reproduced on a display or in printing matches the color the artist envisioned. Various color “systems” have been developed to facilitate this. 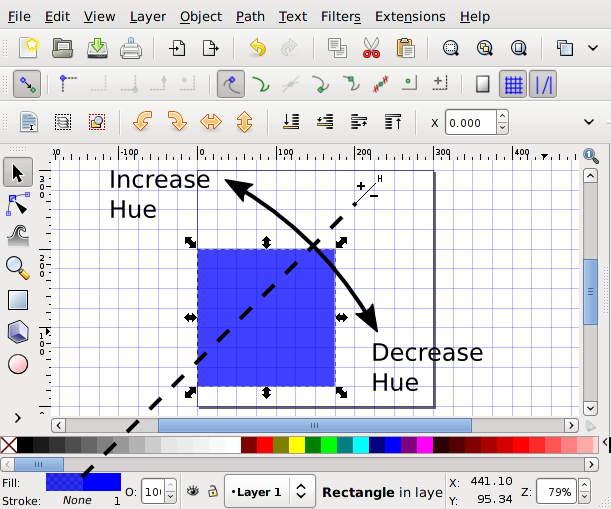 Inkscape supports base ICC profile functionality through the use of LittleCMS. 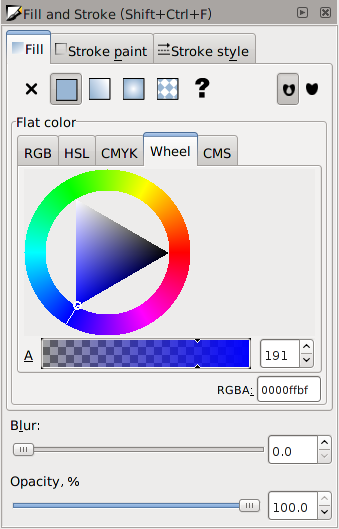 Setting up color management can be done under the Color management section in the Inkscape Preferences dialog. As of v0.47 you can declare multiple ICC profiles for a document in the Color Management tab of the Document Properties dialog. Color management support is only available under Linux and Macintosh OS X in v0.46. Profiles internal to a bitmap are also not handled. A complete discussion of this topic is beyond the scope of this book. The fill color of an object can be modified a variety of ways including using the Fill and Stroke dialog, the Palette, the Swatches dialog, and the Dropper Tool. Some of these methods can also be used to change the color of a Gradient stop when a Gradient handle is selected. When the use of a flat (or solid) color is specified for the Fill and Stroke paint of an object, the corresponding tab of the Fill and Stroke dialog will show five sub-tabs, each one corresponding to a different method of specifying the color plus one for color management. Each method is described next in its own section. Except for the Wheel tab, each color parameter can be set by either dragging a slider (small triangles), typing the desired value into the entry box, using the up/down arrows in the widget (Right Mouse Click on an arrow causes the value to change to the minimum or maximum, Middle Mouse Click cause the value to increment or decrement by 10), or the Up/Down Arrow keys after the entry box is selected. The slider bar shows the current value (triangles) and what the color will look like as that slider is dragged. Methods for setting a color parameter. The A or Alpha attribute specifies how transparent the fill should be, 0 for completely transparent and 255 (100) for completely opaque in the case of the RGB, HSL, and Wheel (CMYK) methods. RGB (Red, Green, Blue) is a method for specifying a color in terms of the three additive primary colors. This is the native method for computer screens. Range of allowed values is from 0 to 255 (0 to FF in hexadecimal). RGB tab for setting Fill color. HSL (Hue, Saturation, Lightness) is a method for specifying color in terms of hue (color in optical spectrum), saturation (intensity-purity), and lightness. The range for saturation is from a pure color to gray. The range for lightness is from black to pure color to white. Range of allowed values is from 0 to 255 (0 to FF in hexadecimal). HSL tab for setting Fill color. CMYK (Cyan, Magenta, Yellow, Key [Black]), is a method for specifying color in terms of subtractive primary colors and is commonly used in printing. Range of allowed values is from 0 to 100. 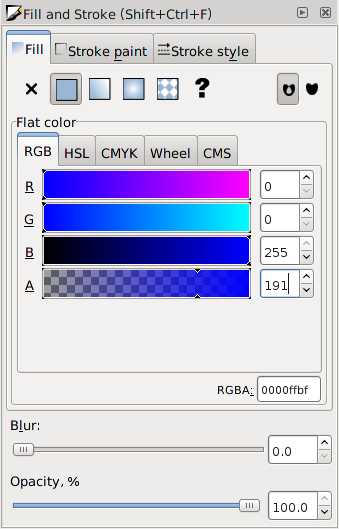 Inkscape stores color internally in the RGB format. This is the only color specification supported by SVG. Furthermore, the entry boxes are set up so that the value in one is always zero. (Any color in RGB color space can be defined using only three of the CMYK terms. The definition is not unique.) Better support for CMYK is planned. CMYK tab for setting Fill color. The Wheel is an alternative way of changing color in the HSL paradigm. Dragging the line around the circle changes the Hue. Dragging the small circle within the triangle parallel to the edge that varies from white to black changes the Lightness and dragging perpendicular to that edge changes the Saturation. Wheel tab for setting Fill color. This tab allows editing of colors managed by an icc profile if enabled. 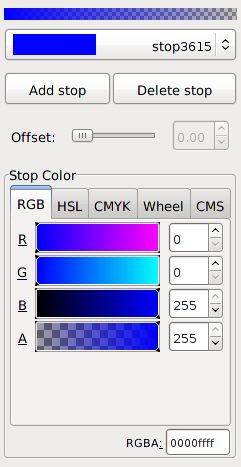 The color Palette, located near the bottom of the main Inkscape window, and the Swatches dialog (View → Swatches... (Shift+Ctrl+W)) allows one to quickly set the color of an object's Fill or Stroke or to set the color of a Gradient Stop. They can also be used to set the Current style. There use is essentially identical so they will be treated together. The visibility of the Palette can be toggled via a check box in the View → Show/Hide submenu. Swatches dialog. Note that clicking on the × rectangle sets the Fill to None. Left Mouse Click on a swatch to change the Fill of selected objects or the color of selected Gradient Stops to the color of the swatch. Shift+Left Mouse Click on a swatch to change the Stroke of selected objects. The Current style will also change (no object need be selected). Left Mouse Drag from a swatch to an object's Fill or Stroke or to a GradientStop to change the corresponding attribute to the swatch's color. Shift+Left Mouse Drag to anywhere on an object to set the Stroke color (except to a GradientStop). The target object need not be selected. The Current style will not change. Left Mouse Drag from a swatch to the Fill or Stroke part of the Style Indicator to change the Fill or Stroke of selected objects. The Current style will also change. Right Mouse Click on a swatch to open a small dialog which allows you to assign the color to the Fill or Stroke of selected objects. The Current style will also change. You can also drag colors to or from other applications that support Drag and Drop. 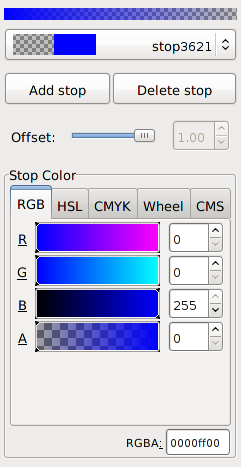 Inkscape has a variety of built-in palettes (some copied from Gimp). More palettes can be added by installing palette files in the directory share/palettes. 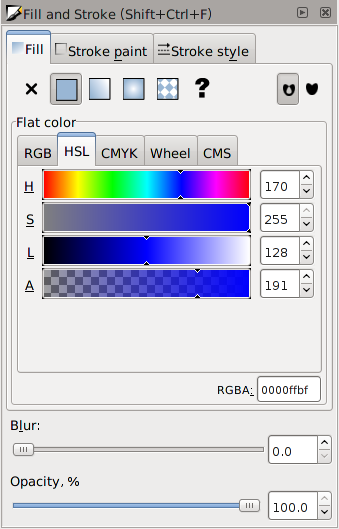 The files use the Gimp palette file structure where colors are defined in terms of a triplet of numbers in a RGB format. See the section called “Custom Swatches or Palettes” in Chapter 23, Customization, for details. 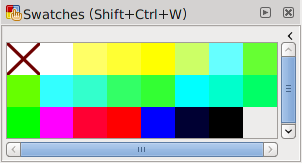 Both the Palette and the Swatches dialog have a pull-down menu (far right) where you can set the size and shape of the swatches, if the colors should be displayed in one row or in multiple rows, and which palette should be used. Hovering the pointer over a swatch will display a color's name in a tool tip and as of v0.47 in the Status Bar. A scroll bar gives access to colors in a palette that are not displayed when there are too many colors to fit. The Style Indicator located on the left side of the Status Bar displays information on selected objects, text fragments, or Gradient stops. The indicator includes a number of methods to alter style including: pop-up menus, targets for Drag and Drop colors, and Color Gestures. The Style Indicator has three parts showing Fill, Stroke paint, and opacity (O), which show attributes for selected objects or text fragments. The Fill and Stroke paint parts are referred to as the fill indicators. The Style Indicator showing the attributes of an object with a red Fill, a blue Stroke paint, a Stroke width of 10 pixels, and a Master opacity of 100%. Color swatch: Shows color with (left) and without (right) Alpha (Alpha refers to the Fill and Stroke paint attributes and not the object's Master opacity). N/A: Not Applicable (i.e., no object selected). L: fill is a linear Gradient. R: fill is a radial Gradient. Pattern: fill is a pattern. Different: More than one object selected with different fill. m: Selected objects have same fill color. a: Selected objects have different fill colors. The color displayed is an average of the colors in the selected objects. For Gradient handles, both parts (Fill and Stroke paint) show the handle color. The Style Indicator has a number of features that depend on the part. A Left Mouse Click opens the Fill and Stroke dialog with the corresponding tab selected. A Middle Mouse Click on a bar removes the fill from the selected objects if a fill is defined. If no fill is defined, it sets the fill to black. A Right Mouse Click on a bar opens a pop-up menu as discussed below. A color from the Palette or Swatches dialog can be dragged and dropped onto one of the fill indicators to change the fill of all selected objects. A Left Mouse Click opens the Fill and Stroke dialog to the Stroke style tab. A Right Mouse Click opens the a pop-up menu that allows the stroke width unit to be changed as well as a preset width to be selected. The stroke can also be removed with this menu. A Right Mouse Click on the numeric field opens up a pop-up menu with preset opacity values. A Middle Mouse Click on the "O:" label cycles through the opacity values 0%, 50%, and 100% (0.0, 0.5, and 1.0). A Right Mouse Click on either the Fill or Stroke paint bar opens a pop-up menu with entries that act on the Fill or Stroke paint of the selected objects or text fragments, depending on which bar was clicked. If a Gradient handle is selected, the menu entries apply to that handle. The Style Indicator pop-up menu. Last set color: Applies the last set color to the Fill or Stroke paint of selected objects. A color is set when a color is applied to any object or when a color is selected from the Palette. Last selected color: Applies the last selected color to selected objects. The last selected color is the color of the previously selected object(s) prior to selecting the object(s) whose color is to be changed. If the color is to be applied to multiple objects, they must be selected together using a rubber-band selection. Invert: Inverts the color of the Fill or Stroke paint of selected objects. If more than one object is selected, the colors of those objects are averaged before the color is inverted. The opacity is not changed. White: Set Fill or Stroke paint to white. Black: Set Fill or Stroke paint to black. Copy color: Copies color of selected objects to the clipboard in hexadecimal format. If more than one object is selected, the colors of those objects are averaged. Paste color: Pastes color to selected objects from the clipboard. Swap fill and stroke: Exchanges Fill and Stroke paint colors. Unset fill (stroke): Unsets the Fill or Stroke paint of selected objects. Remove fill (stroke): Removes the Fill or Stroke paint of selected objects. Color Gestures is the name give to changing the color of a Fill, Stroke, or Gradient Stop by dragging the mouse from a fill indicator into the Inkscape window. The principle is that as you drag the mouse, the color will change proportionally to the distance from a 45° line from the indicator. The farther away you are, the more subtle the changes can be. Changes are made in the HSL color space. Color Gestures: Dragging the cursor away from the Fill indicator to the left or up from the dash line increases hue (blue to red) while dragging to the right or down decreases hue (blue to green). Dragging straight up or straight across results in the maximal change possible (blue to yellow). Note the small H on the cursor. This indicates that hue is being altered. With out any modifier key, changes are made to hue. With the Shift changes are made to saturation while with the Ctrl changes are made to lightness. Note that the letter next to the cursor will change to indicate the mode. Key modifiers can be changed while dragging. When a key modifier is changed, the “zero” line (normally at 45°) changes to pass through the current cursor position. This is to avoid abrupt changes in color when changing modifiers. The Alt modifier disables changes to the color so that the cursor can be repositioned. If more than one object or Gradient Stop is selected, the starting color will be the average color of the selected items and the final color will be the same. If you wish to shift the color in the same way for a number of objects but preserve the relative differences use the Tweak Tool. Color gestures are very useful once you get the hang of them. It is well worth spending a little time to play with them! The Fill and Stroke paint color of an object can be changed by using the Dropper Tool to grab an existing color in the drawing. Options allow for grabbing the average color over a circular region, inverting the grabbed color, and saving the grabbed color to the system clipboard (as a RGBA hexadecimal number). To use the Dropper Tool, first select the object that you want to modify with a tool other than the Dropper Tool. Recall that you can switch temporarily to the Select Tool by using the Space Bar. Then select the Dropper Tool by clicking on the icon (F7 or D) in the Tool Controls. Finally click with the Dropper Tool on the desired color. The shortcut D will toggle between the Dropper Tool and any other tool. The Shift causes the chosen color to be applied to the object's Stroke paint rather than the Fill. The Alt causes the inverse color to be applied. The Shift and Alt keys can be used in combination. However, neither of the modifier keys are useful when copying a color to the clipboard. Left Mouse Click: Pick Fill color. Left Mouse Drag: Pick average Fill color (color is averaged over circle created during drag). Ctrl+C: Copy color under cursor to system clipboard in the form of an 8-digit hexadecimal number (two digits for each of RGBA). The Dropper Tool Tool Controls has two buttons that determine if the opacity (Alpha) of a color should be Picked and/or Assigned. These settings affect the way a color is picked if the “Picked” object has an opacity different from 100% (or 1.0). The Dropper Tool-Tool Controls. Note that icons were used instead of labels in v0.46. Pick opacity disabled: The color picked is as shown on the screen. For example, picking the color from an object with a dark blue fill but an opacity of 50% would result in a light blue color with an opacity of 100%. Opacity of set object not changed. Pick opacity enabled, Assign alpha disabled: The color picked is the color that the object would have if its opacity was 100%. A dark blue object with an opacity of 50% would result in a dark blue color (an opacity of 100%). Opacity of set object not changed. Pick opacity enabled, Assign opacity enabled: The color and opacity are both copied from the picked object. A dark blue object with an opacity of 59% would result in a light blue color composed of a dark blue fill with an opacity of 50%. Opacity of set object changed. Note: This is only applicable if the color is picked from an object with transparency that is not over another object. Color squares shown with the numerical values of their color (hexadecimal) and opacity. From left to right: Picked color, assign color with Pick disabled, assign color with Pick enabled but Assign disabled, assign color with both Pick and Assign enabled. In all cases, the original opacity of the “Set” squares was 100%. Onscreen creation and editing of intermediate Stops added in v0.46. Gradients are a smooth blending from one color to another. Gradients can be used to build up complex shading of an object as shown in the flower petal below. Note: Inkscape supports the Gaussian Blur filter, which may be an easier way to produce complex shadings. A flower petal consisting of four layers. From left to right: The finished petal. The base layer. A highlight. A duplicate of the base layer with partial transparency to mask part of the highlight layer. Top shadow layer. The background is gray to show the transparency in some layers. In Inkscape, Gradients can be linear or radial and can consist of transitions between two or more well-defined colors referred to as Stops. An example of a linear (left) and a radial Gradient (right), both with three defined colors or Stops. Inkscape does not support nonlinear Gradients. 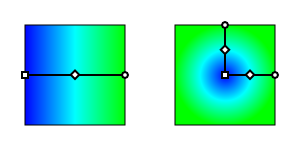 Nonlinear Gradients can be simulated by adding extra Stops. Attach a Gradient to an object. Adjust the orientation and extent of the Gradient. The use of linear and radial Gradients is essentially the same and both will be treated together. If you want a Gradient to transform with an object, you must toggle on this option using the icon that is in the Tool Controls when the Select Tool is in use. Gradients can be attached to an object either with the Fill and Stroke dialog or through the use of the Gradient Tool. To attach a Gradient with the Fill and Stroke dialog, simply select an object and click on either the linear or radial Gradient icons in the dialog. A Gradient with two Stops will automatically by created and applied to the object. The Stops will have the color of the previous Fill with one Stop having full opacity and the other full transparency. The following figure shows the dialog after attaching a Gradient this way. Gradient selected in Fill and Stroke dialog. An already defined Gradient can be assigned to the object by selecting the Gradient from the drop-down menu under the Fill tab of the Fill and Stroke dialog. A Gradient can also be assigned to the Stroke of an object under the Stroke paint tab. To attach a Gradient with the Gradient Tool, select the tool by clicking on the icon (Ctrl+F1 or g) in the Tool Box. The Gradient Tool Tool Controls has options to choose a linear or a radial Gradient and the application of the Gradient to the Fill or Stroke of an object. Once the options are selected, Left Mouse Drag across an object to attach a Gradient. The start and stop point of the drag will define the range of the Gradient (where the start and end Stops are placed, see below). If an already defined Gradient has been chosen from the drop-down menu in the Tool Controls it will be applied to the object. Otherwise a two Stop Gradient will automatically be created with both Stops the color of the objects existing Fill and with one Stop full opacity and the other with full transparency. 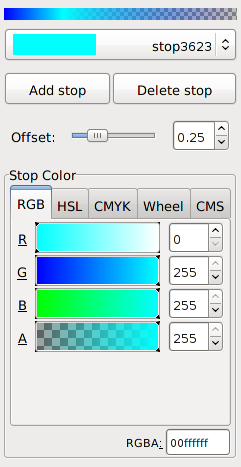 Gradients can be modified by adding, deleting, moving, or changing the color and opacity of Stops. 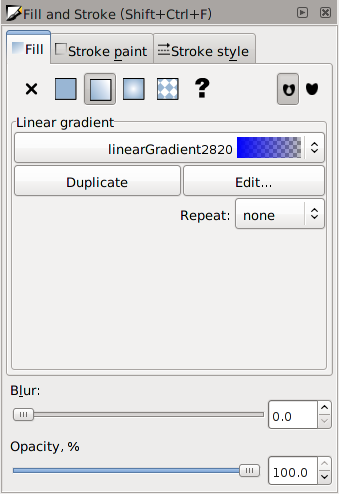 As of Inkscape v0.46, Gradients can be edited onscreen. This is much more convenient than using the Gradient Editor dialog. An object with a Gradient displays Gradient handles when the Gradient Tool, Node Tool, or one of the shape tools is active (the latter two if enabled in the Inkscape Preferences dialog). Some editing actions work when any of these tools is active, others work only with the Gradient Tool. Circle, diamond, and square handles represent start, intermediate, and end Stops respectively. Editing Stops has many parallels to editing nodes. 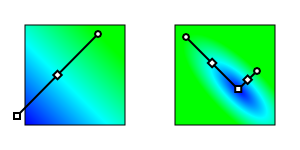 Linear and radial Gradients showing the Gradient handles. Stops can be selected by clicking on them with the Gradient Tool, the Node Tool, or one of the shape tools. To select more than one use Shift+Left Mouse Click. With the Gradient Tool you can use a rubber-band selection by using Shift+Left Mouse Drag or you can select all the Stops by using Ctrl+A. Double click on the Gradient path. A new Stop will be added where you clicked. The Stop will take the existing color under the path. Note that at least one Stop must already be selected. Ctrl+Alt+Left Mouse Click on the Gradient. A new Stop will be added where you clicked. The Stop will take the existing color under the cursor. Select two adjacent Stops and press Insert. A new Stop will be added halfway between the selected Stops and with a color halfway in-between. Drag a color from the Palette or the Swatches dialog unto the Gradient path. A new Stop will be created with the dragged color at the point of the drop (drop too far from the path and the Fill will be changed to solid with the dragged color). This also works if the Node Tool or one of the shape tools is active. Click on it using Ctrl+Alt+Left Mouse Click. This also works if the Node Tool or any of the shape tools are active. Use the Del to remove selected Stops. If there is at least one intermediate Stop then deleting the start or end Stops will shorten the Gradient with the nearest intermediate Stop becoming a start or end Stop. If there is no intermediate Stop then deleting a start or end Stop will replace the Gradient with a solid Fill of the color of the remaining Stop. Using Ctrl+L will attempt to simplify the Gradient over the a region defined by selected Stops by adjusting and removing some Stops. This is particularly useful for removing redundant Stops. Drag it with the Gradient Tool, Node Tool, or one of the shape tools. If more than one Stop is selected they will all move together. Dragging with the Ctrl snaps the Stops at points that are multiples of 1/10th of the distance between the nearest neighboring unselected Stops. Dragging with the Alt moves selected Stops according to how far away they are from the dragged Stop. With one or more Stops selected and the Gradient Tool active, use the Arrow keys. If multiple intermediate Stops are selected, they will move together. Using the Shift with the Arrow keys accelerates the shift by a factor of 10. Using the Alt moves the selected Stops one screen pixel at a time. Using Shift+Alt moves the Stops 10 screen pixels at a time. Note: You cannot move a Stop past an adjacent Stop. There are several ways to see and change the style (color and/or transparency) of one or more Stops. In general, if no Stop is selected, indicators and changes apply to the whole object; if one Stop is selected, indicators and changes apply to that Stop; and if multiple Stops are selected, indicators show an average value for the selected Stops and changes apply to all selected Stops. The Fill and Stroke dialog: If no Stop is selected the Gradient is previewed at the top under the Fill or Stroke tab. Otherwise the current color and opacity values for selected Stops are shown. Changes apply to all selected Stops. The Style Indicator: If no Stop is selected the indicators show previews of the Gradients (Fill and Stroke). Otherwise the current values for selected Stops are shown. Changes apply to all selected Stops. See the section called “Style Indicator”, earlier in this chapter for more details. Drag-and-Drop: Colors can be dragged from either the Palette or from the Swatches dialog onto Stops (or onto the Gradient path to add a new Stop). Copy-and-Paste: Colors can be copied to and from the clipboard. Copying to the clipboard (Edit → Copy (Ctrl+C)) will copy a Stop color and opacity if one Stop is selected or the average color if more than one is selected. Pasting the style (Edit → Paste Style (Shift+Ctrl+V)) copies from the clipboard the color and opacity to all selected Stops. There is a dedicated Gradient Editor dialog for editing Gradients. It is envisioned that this dialog be removed as redundant in the future. To call up the dialog, click on the Edit... button, either in the Fill and Stroke dialog or the Gradient Tool-Tool Controls. Note that which Gradient is being edited does not change automatically when you select an object with a different Gradient. Gradient Editor dialog showing first default Stop. To edit another Stop, select that Stop in the pull-down menu. In the default case described above, the second Stop has the same color as the first but is fully transparent (e.g., Alpha = 0). This is shown in the current Stop section by the divided box. The left half shows the color with Alpha and the right half without Alpha. Note also that the Offset slider is fully to the right. Gradient Editor dialog showing second default Stop. To add a Stop, click on the Add stop button. The new Stop will be added to the right of whichever Stop was selected, unless that Stop was the farthest to the right, in which case the new Stop will be added to the left. The position, color, and transparency for the new Stop will be set to halfway between its neighbors. 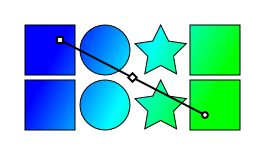 The following figures show a third Stop added to a Gradient after its color and position have been adjusted. Gradient Editor dialog showing added third Stop. Note that the new Stop has an offset of 0.25, that is the center of the Stop will be one quarter of the Gradient width from the left. An example of a Gradient, before and after adding a third Stop. To delete a Stop, select the Stop, then click on the Delete stop button. As at least two Stops are required to define a Gradient, you cannot delete a Stop if only two are defined. Once a Gradient has been applied to an object, the orientation and extent of the Gradient can be changed via dragging the outer two Gradient Stops indicated by the square and circle handles. The handles appear when the Gradient Tool is selected. They will also appear by default when many of the other tools are selected (controlled by the Enable Gradient editing option in the Inkscape Preferences dialog under each tool tab). For linear Gradients, one set of handles define the range of the Gradient. The Gradient is parallel to the line connecting the two handles. For radial Gradients, there are two sets of handles (or Stops) at right angles to each other, sharing the square center handle. 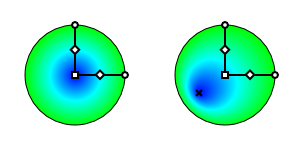 The center, handle controls the origin of the Gradient (one “edge”), while the two circular handles control the range of the Gradient in orthogonal directions. This allows a radial Gradient to have an elliptical shape. 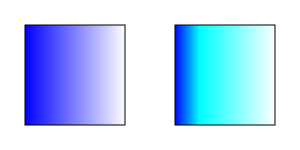 Linear and radial Gradients showing the Gradient handles after adjusting the orientation and range of the Gradient. A radial Gradient can be made asymmetric by dragging the center handle (diamond) while holding down the Shift key. A cross will appear where the center of the Gradient is located. The cross can be dragged to make further adjustments. 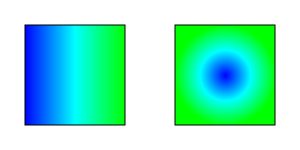 A radial Gradient with a symmetric fill (left) and an asymmetric fill (right). Gradient handles from two different objects will snap together if one is placed over the other. This facilitates aligning Gradients between different objects. The handles will then move together. If multiple objects are selected when a Gradient is created, all the objects will share a common Gradient. The eight objects share a common Gradient. An option only accessible through the Gradient tabs of the Fill and Stroke dialog is defining how the area outside the Gradient range is filled. The three options are: fill with the solid color of the edge Stops (None), fill with a reflection of the same Gradient (Reflect), and fill with a translation of the same Gradient (Direct). The effect of these three options is shown next. An example of a linear Gradients with different repeat options. From left to right: None, Reflected, and Direct. An example of a radial Gradient with different repeat options. From left to right: None, Reflected, and Direct. The keyboard shortcut Shift+R reverses the Gradient direction when the Gradient Tool is active. This is especially useful for radial Gradients where one cannot just drag the Gradient handles to reverse the Gradient. Any object or set of objects can be turned into a Pattern and used in the fill of an object. The Pattern can be shifted, rotated, and stretched as necessary. 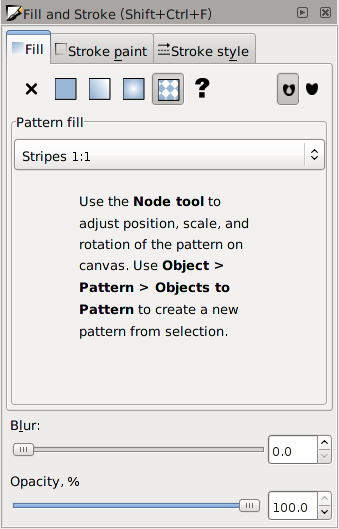 Inkscape, as of v04.6, includes a set of Patterns accessible through the Fill and Stroke dialog. The Vine Design tutorial covers creating and using Patterns. A few of the Patterns included in Inkscape. The Patterns included with Inkscape are defined in the file patterns/patterns.svg located in the Inkscape “share” directory. Edit or replace this file to include your own stock Patterns. To use a Pattern, two or three steps are necessary. The first, optional step, is to create a Pattern. The second is to apply the newly created Pattern or an Inkscape provided Pattern to an object. And the third is to adjust the Pattern position and scaling as necessary. Patterns are very easy to create. Simply select the object or objects you wish to use as a Pattern and then use the Object → Pattern → Objects to Pattern (Alt+I) command. After converting the selection to a Pattern, the original selection is replaced by a Rectangle shape object filled with the new Pattern (and with an invisible stroke). This new object can be deleted but the Pattern will remain. Patterns have a life of their own. The “tile” size of the Pattern is the total bounding box of the objects in the Pattern. If space is required around the objects, a nonvisible rectangle object can be added or the Pattern size can be edited with the XML Editor dialog. The object(s) in any Pattern can be edited by selecting an object that is filled with that Pattern and then using the Object → Pattern → Pattern to Objects (Shift+Alt+I) command. The original objects will reappear in their original place (built-in Patterns will appear in the upper-left corner). After editing, the objects can be again turned into a Pattern. Both the old and new Patterns are available for use. Other objects filled with the original Pattern remain unchanged. The new Pattern must be “reapplied” to the object the Pattern came from. To change the fill of an object to a Pattern, simply click on the Pattern icon ( ) in the Fill and Stroke dialog. Then select the required Pattern from the pull-down menu. User created Patterns will be listed first. Pattern section of Fill and Stroke dialog. Unfortunately, there is no preview of the Patterns (as with the Gradient tab). If you want a Pattern to transform with an object, you must toggle on this option using the icon that is in the Tool Controls when the Select Tool is in use. Inkscape versions prior to v0.47, do not export Patterns to PS, EPS, and PDF files correctly. Note also that the Evince PDF viewer does not render Patterns correctly (Acroread does). Adjusting Patterns is done by a set of handles. The handles will appear when an object with a Pattern fill is selected and the node or one of the shape tools is active. The handles will appear on the original objects that defined the Pattern, or the former location of those objects if they have been moved or deleted (unless the Pattern has been previously adjusted). In the case of built-on Patterns they will appear in the upper-left corner of the canvas. The following figure shows the location of the handles for a Pattern that has not been adjusted. 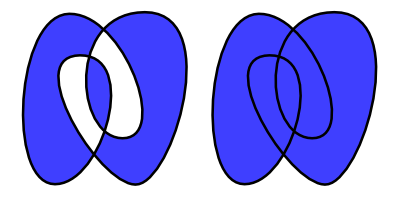 A Pattern (right) with an object filled with that Pattern (left). The translation handle is a "×" overlaying a Rectangle shape handle. The size handle is a square and the rotation handle a circle. 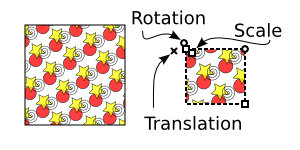 To adjust the origin, scale, and orientation of the Pattern, drag the translation handle (×), scale handle (square), and rotation handle (circle). The translation handle can conveniently be dragged over the object with the Pattern fill. Holding the Ctrl key down while dragging will restrict the movement to the horizontal or vertical direction. 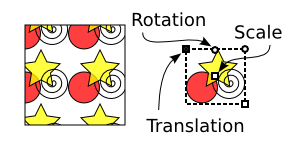 The scale is governed by the distance between the translation handle and scale handle, the orientation by the relative position of the rotation handle with the translation handle. As of v0.47, the x and y directions can be scaled independently. Hold the Ctrl down to force the scaling to be uniform. Handles can be snapped, also as of v0.47. The following figure shows how the fill changed after the handles have been adjusted. A Pattern filled object (left) after adjusting the Pattern shown on the right. The Pattern was adjusted by dragging the handles shown. For SVG viewers that don't support clipping, you can crop a bitmap by turning the bitmap into a Pattern and using it to fill an arbitrary path. A demonstration of cropping a bitmap image. Left: Original image. Center: Image after converting to Pattern and using as Pattern for circle. Right: Image after enlarging and shifting Pattern. Inkscape now includes many Patterns that can be used as hatchings. If you need to create a new hatching, here is the general procedure. The simplest hatching is to group two rectangular boxes, one with black fill and one with no fill as shown below. 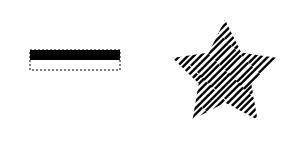 The hatching Pattern on the left (surrounded by the dotted line) has been used for the star's Fill. The Pattern consists of two rectangles in a Group. Inkscape has problems properly displaying Patterns at the Pattern boundaries. Inkscape export to a PNG also has problems. To work around this problem, you can make the Pattern rectangles wider than the maximum width needed to fill an object. Firefox, Opera, and Batik will display patterns without artifacts. Batik can be used for producing a high-quality PNG. The difference between these rules is demonstrated in the following figures. Fill rule: Even-odd vs. Non-zero. Even-odd rule. In this rule, you start outside the path with the number zero. Every time you cross the object's path, you add one to the number. If the current number is odd, the region is inside the path and therefore colored. If the current number is even, the region is outside the path and is not colored. Fill rule: a demonstration of counting. Even regions are outside the path, odd regions are inside. Non-zero rule. In this rule, you start outside the path with the number zero. Every time you cross the object's path with the path going to the left, you add one to the number. If the path is going to the right, you subtract one. 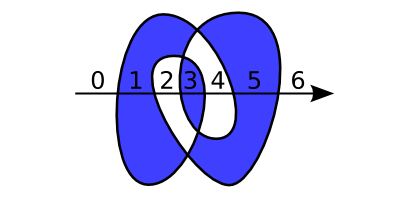 If the number is non-zero, the region is inside the path; if it is zero, the region is outside the path. Non-zero fill rule applied to a path consisting of two sub-paths. Zero regions are outside the path; non-zero regions are inside the path. The arrows on the paths show the paths' direction.